One by one, children of New York’s wealthiest are taken hostage. But the criminal doesn’t crave money or power–he only wants to ask the elite if they know the price others pay for their luxurious lifestyles. And, if they don’t, he corrects their ignorance–by killing them. To Detective Michael Bennett, it becomes clear that these murders are linked and must be part of a greater, more public demonstration. With the city thrown into chaos, he is forced to team up with FBI agent Emily Parker, and the two set out to capture the killer before he begins his most public lesson yet–a deadly message for the entire city to witness. From the bestselling author who brought you the Alex Cross novels comes James Patterson’s most action-packed series yet. With the heart-pounding suspense that only Patterson delivers, WORST CASE will leave you gasping for breath until the very end. Lately I haven’t been listening to many audiobooks, or books on MP3, because I have found that I haven’t had the time. 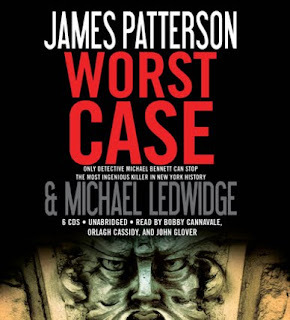 I love James Patterson’s books so much, though, that I thought it would be great to listen to his newest book Worst Case. It sounded like it could be an amazing book so I was hoping it was as great as I anticipated. I was on a long road trip when I began listening to Worst Case and I found myself drawn into the story immediately. It begans with a man who wants to change the world by bringing people together. He finds himself bitterly disappointed, however, and decides that violence is the only means he can use to force others to realize society needs to change. The story then moves to the kidnapping of a number of affluent young adults whose parents are CEOs and run major corporations. The kidnapper keeps directing the police to the the young adults, but all they do is continuously find dead bodies! Mike, a detective with the NYC Major Crime Unit, and Emily, a Special Agent with the FBI, are brought together to try and track down the kidnapper-turned-killer before more young people have to die! I absolutely adored this book! I loved the fact that the novel focuses on the murders and has a lot of suspense in it, but there is also an underlying theme of the romantic interest building between Mike and Emily. I also enjoyed the fact that this audiobook actually has there narrators – the combination of two male narrators and one female narrator (primarily playing the role of Mike, of Emily and of the kidnapper/murderer). It added a layer of realism to the novel and makes for a more interesting narration of the story! I also liked the fact that the audiobook was relatively short (approximately 7 hours) and that the chapters are short. It was great for the long journey but also made it easy to finish today because I could finish a chapter, go off and get some other things, and easily return to the novel to continue listening. Until listening to Worst Case, I wasn’t familiar with Detective Mike Bennett. I discovered that this novel was actually the third book with Mike as the main character. I was glad that, not having read the first two books, it was easy to listen to this book as a stand-alone novel. I really enjoyed listening to Worst Case and I would highly recommend it. I plan to read the first two books (Step on a Crack and Run for Your Life) because I enjoyed this novel so much! Like Patterson’s other famous character, Alex Cross, I hope there are many more Mike Bennett books to come because this one was so entertaining! my 35 y.o. son is a huge patterson fan!! James Patterson is one of my favorite authors, I’d love to have this book!